In 1820, the world was made up of 125 sovereign states. By the end of the first wave of globalisation in 1914, the number of countries had fallen to 54. 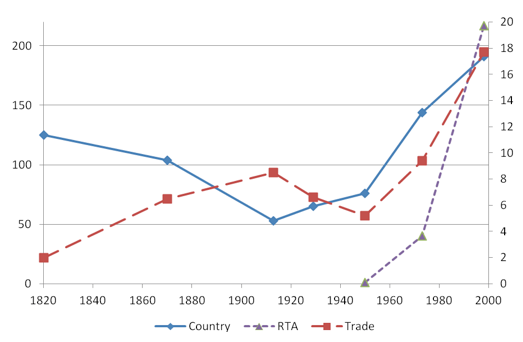 The interwar period witnessed a reversal of these trends – trade collapsed and the number of sovereign states rose to 76 by 1949. Until then, political and economic integration had proceeded together. Yet, the end of WWII marked the beginning of a new era. The second wave of globalisation that started after 1950 has led trade to flourish to levels never seen before. But this time the process of economic integration was accompanied by different changes in the world political structure. On the one hand, the number of countries has risen to a record high of more than 190. On the other hand, there has been a proliferation and growth of international treaties aimed at fostering economic integration, such as the WTO and the EU. These trends are illustrated in Figure 1. Note: Merchandise exports as percent of GDP (Maddison 1995, 2001 on right axis), number of countries (Butcher and Griffiths 2013) and WTO membership (left axis). The incidence of violence in the process of redrawing political borders shows another reversal. Before 1950, more than one third of all territorial disputes were decided by war, while after that date diplomacy prevailed in almost 90% of cases. Why did the first wave of globalisation lead to political concentration and conflict? Why did the second wave of globalisation lead instead to political fragmentation, resolved in a more peaceful way? To answer these questions, in a new paper we develop a model to study the interaction between globalisation and political structure (Gancia et al. 2017). A key premise of our theory is that borders hamper trade and globalisation make borders more costly. We show that political structure adapts to expanding trade opportunities in a non-monotonic way. In early stages, borders are removed by increasing the size of countries. In later stages, the cost of borders is removed by creating economic unions, and this leads to a reduction in the size of countries. Moreover, while the incentive to conquer markets through aggression increases with globalisation, international economic unions remove this incentive, thereby paving the way to the rule of diplomacy. Our theory builds on the classic work of Alesina and Spolaore (1997), who argued that country size trades off preference heterogeneity and economies of scale. Preference heterogeneity across space creates a force towards political fragmentation, as each geographical unit or ‘locality’ would like to have a different government. Economies of scale create, instead, a force towards political concentration, as some fixed costs of running a government can be shared by localities. We depart from this work in two important ways. First, we add trade and model globalisation as a decline in the cost of shipping goods between localities. Second and most importantly, we recognise that the governments are multidimensional. In particular, governments provide both the economic regulations necessary for markets to work, such as contract enforcement and protection of property rights, and public services, such as education and welfare programmes. Sharing economic regulations promotes trade. Public services instead provide utility, but localities have different preferences over them. This distinction expands the set of possible political structures. We can think of countries as sets of localities sharing economic regulations and public services, and economic unions as sets of countries sharing economic regulations but not public services. The non-monotonic effect of globalisation on political structure follows from the presence of economies of scope – coordinating different levels of government is costly and, as a result, having both countries and unions is more expensive than a single-level structure in which countries provide both public services and economic regulations. A key aspect of any theory of political structure is a view of how localities interact. As a benchmark, we consider the case in which localities are sovereign and free to sign political contracts among themselves. Such a view can be described as the rule of diplomacy. But diplomacy is hardly the only form of interaction in the real world. Hence, we also consider an alternative case in which we allow a set of core localities to wage war and build empires. War is costly but it allows core localities to impose their preferences on colonies. In this case, we find that there is an intermediate stage of globalisation in which core localities choose to wage war and build large empires that grow rapidly in size. These empires eventually collapse as the world enters the third and final stage of globalisation. The world economic union makes them obsolete. Interestingly, the cause of imperial collapse at a late stage of globalisation is exactly the same as the cause for the rise of empires at an early stage, namely, the desire to reap gains from trade. It is just that, at some point, it becomes more cost-efficient to replace conquered colonies with free partners in an economic union. These new predictions are consistent with the rise and fall of colonial empires. They can explain why changes in political structure are associated with conflict and aggression during the first wave of globalisation, when empires are created and expand. They can also explain why changes in political structure are peaceful during the second wave of globalisation, when economic unions are formed. We obtain additional insights once we impose a core-periphery structure to the model. Core countries have a stronger incentive to form a core union, which may be subsequently enlarged to include periphery countries. Thus, the core-periphery model predicts that international unions start from countries that have closer economic ties and expand outward as globalisation increases the value of trade with more remote locations as well. This prediction is consistent with the history of the EU, which started in 1957 when Belgium, France, Italy, Luxembourg, the Netherlands, and West Germany signed the Treaty of Rome, and expanded gradually to include up to 28 member states in 2013. Yet, in June 2016 the UK voted to leave the Union and there is a concern that other countries might follow in the future. In light of these events, we discuss three lessons that can be learned from our model. First, in our theory the value of union membership is proportional to the economic ties between countries. These are stronger for countries located in the core of continental Europe. For instance, while almost 80% of Belgium's exports are delivered to other EU partners, the same figure is around 50% for the UK. Second, our model provides a rationale for trade-promoting unions. As more power is shifted to the union in other areas, tension may arise, especially in countries with a strong national identity. Third, the model suggests that the value of joining the union is proportional to its size. As a country exits, the economic foundations of the union become more fragile. Our theory suggests that the forces of globalisation can help explain three salient phenomena in recent history. First, the rise and subsequent fall in the size of countries observed since the 19th century. Second, the seemingly contradictory trends towards more political integration across countries and more political fragmentation within countries in the second half of the 20th century. Third, the redrawing of borders through war in the first wave of globalisation but through diplomacy in the second. Our theory also raises important questions. Since the size of markets grows rapidly while political borders tend to change slowly, it suggests that globalisation is likely to put more pressure on the world’s political structure. Designing political institutions that can optimally adapt may become one of the major challenges faced by modern societies. Alesina, A, and E Spolaore (1997), "On the Number and Size of Nations", Quarterly Journal of Economics 112, 1027-1056. Alesina, A, E Spolaore, and R Wacziarg (2000), "Economic Integration and Political Disintegration", American Economic Review 90 (5), 1276-1296. Butcher, C, and R Griffiths (2013), “Introducing the International System(s) Dataset (ISD), 1816-2011”, International Interactions 39 (5), 748-768. Gancia, G, G A M Ponzetto, and J Ventura (2017), “Globalization and Political Structure”, CEPR Discussion Paper no. 11159. Maddison, A (1995), Monitoring the World Economy, 1820-1992, Paris: OECD. Maddison, A (2001), The World Economy: A Millennial Perspective, Paris: OECD. Unlike us, Alesina et al. (2000) find that globalisation always reduces country size. Their analysis differs in two crucial ways. First, they assumed that economies of scope are so large that the world union is never an option. Second, they modelled globalisation as a reduction in the border effect and not in transportation costs. In our model, the border effect is removed endogenously by the creation of the union.